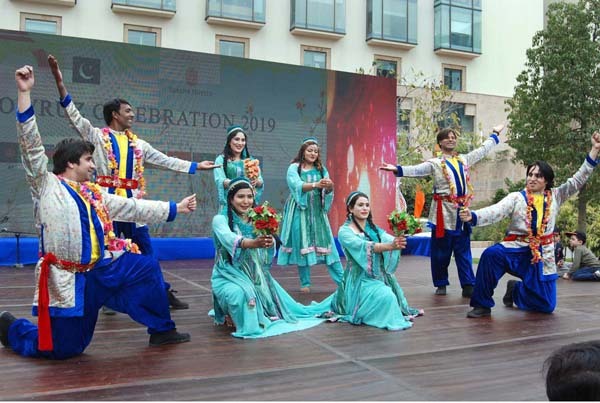 ISLAMABAD, Mar 24 (APP):The management of a local hotel in collaboration with the Diplomatic Missions has organized one-day “Nowruz celebration 2019” here on Sunday. The diplomatic missions including Afghanistan, Azerbaijan, Iran, Kazakhstan, Kyrghyzstan, Tajikistan, Turkey, Turkmenistan, Uzbekistan and United Nations have set up their food and crafts stalls in one day cultural event to celebrate Nowruz. Pakistan National Council of the Arts (PNCA) had also set up a arts and crafts stall at the festival. The event was attended by a number diplomats and people from different walks of life. The students of various schools also performed on the songs of participating countries. The songs of all the participating countries were also played in the festival. Director General PNCA Syed Jamal Shah told APP that such events would play vital role in further strengthening the cultural ties among the brotherly countries. He said Nowruz means a new day and it marks the arrival of spring. He lauded the local hotel and diplomatic missions to arrange the event to celebrate Nowruz in a traditional manner with cultural performances, music and folk dances. Nowruz is celebrated in Pakistan in Wakhi, Shina, Balti, Barushaki, Wakhi, and Khuwar communities in Gilgit-Baltistan and Chitral.